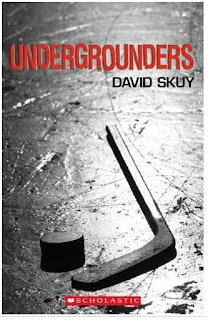 David Skuy is back with another hockey themed young adult novel, Undergrounders . Can playing hockey help a street kid get his life back? After his mom dies, and the landlord kicks him out, 12-year-old Jonathan faces the loneliness and danger of life on the streets -- until he meets Lewis. Lewis takes him under his wing and leads him to his new home among a group of kids living in an abandoned underground shopping mall who call themselves the "Undergrounders." Now renamed "Mouse," Jonathan runs errands, delivers packages and panhandles for food money. An escape from this life underground comes to him in the form of hockey gear. Stolen hockey gear, but hockey gear nonetheless. He suits up and heads to the community rink, where he befriends regular kids who welcome him into their game and onto their team. He agrees, knowing he can never tell them about being homeless. Playing hockey makes him feel like a kid again, but keeping his double life a secret proves to be more difficult and dangerous than he ever could have imagined. David Skuy is a lawyer, a writer and a Leafs fan to the core. He spent most of his childhood playing some sport or another. What he remembers most is the intensity, the competitiveness, and the sheer enjoyment of playing a sport you love when you’re young. David lives in Toronto, Ontario. Scholastic also offers a sample passage on their website. i am almost done reading this book and i can notnput it down! the subject is very mature but i would think that kids 11+ could read it and understand it. younger kids could read it but they may not be able to understand it and/or feel uncomfortable. But nonetheless great book i recomend it to everybody my age and have to all my friends and the love it. I read this book for silverbirch at my school! And this is far by my favourite! I strongly reccomend this story! Even if you don't like hockey!